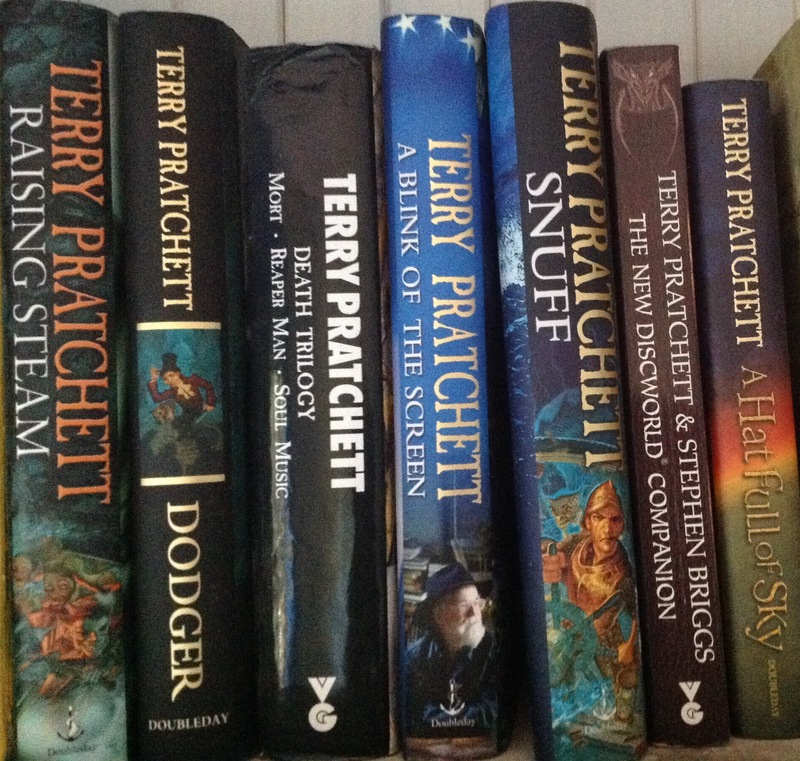 About six years ago, I wrote a paean in praise of Terry Pratchett – because I have, for over 30 years, been enthralled by his prose. And then yesterday, I heard that he had died. No! I cried. No!! again!! For years now, it has been my ritual to give my son at Xmas the newest in the Diskworld series that Sir Terry so kindly provided – for years. Then he started the Long Earth series, and I started buying those for myself – my son now being 22, and quite capable of buying his own. Now there will be no more – barring some tidying up of his estate, and tribute collections, and reissues. I am devastated. The good thing is, I still have ALL my books AND my son’s – which amounts to both a pre- and post-Diskworld collection, which should take me a couple of years to re-read. Terry, we will not forget you. Thank you. And seeing as I don’t think I could write it any better now, here’s my prescient offering from 2009. “You know, [I have] long held the view that nine-tenths of literature – in terms of the requirements of Sturgeon’s Law – is crud. The corollary to this is, of course, that nine-tenths of all literary criticism is crud, except that this is not true: it is more like 99%…. And of course, a further corollary is that nine-tenths of all literary critics are crud – except that this is also not true, as they are in fact all crud. 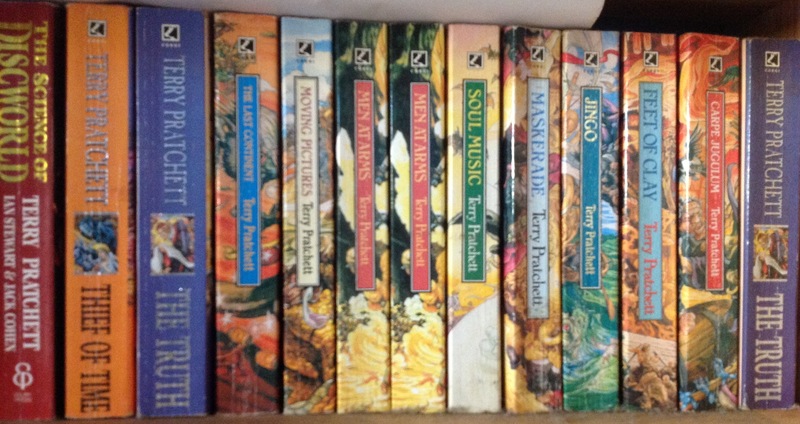 And a glowing exception to the literature rule is the fiction of one Terry Pratchett. Yes, despite his having single-handedly having invented a genre (science fantasy satire), and having written some 30+ books in said genre, it may be said that all his offerings are gems beyond compare. [I speak] with the authority inherent in his having read all of said oeuvre over more than twenty years, [now over thirty] and nearly all of them more than once (many recently, in search of Escape), and having read his non-science fantasy satire books before he was famous. These are of course few in number – if two can said to be “few”, rather than just a couple. However, I can safely claim to have read “Dark Side of the Sun” WAAAAY before TP achieved serious fame, and to have read “Good Omens” before Diskworld became the famous structure it is today. To read his works is to submerge yourself in a world where the whimsical and the side-splittingly funny share a stage with the learned, the knowledgeable, the erudite and the sensitive, and yes, their cousin the sad. For TP is nothing if not well informed, well educated, accurate – and an astonishingly good observer of human behaviour. And also of the behaviour of dwarfs, trolls, vampires, werewolves, witches, policemen, wizards, and of Death Himself. And his horse, Binky. In a world which is a disk, borne on the back of four elephants standing on the back of the great turtle A’Tuin, who bears this load uncomplainingly across the universe, through billenia. With the odd diversion down the wrong trouser leg of Time. With humour. And pathos. And acute sensitivity. Catch me any pre-post-demi-modernist who could do any of that, and I’ll show you your derrida…. Wander well, Terry, in the playgrounds of our minds. 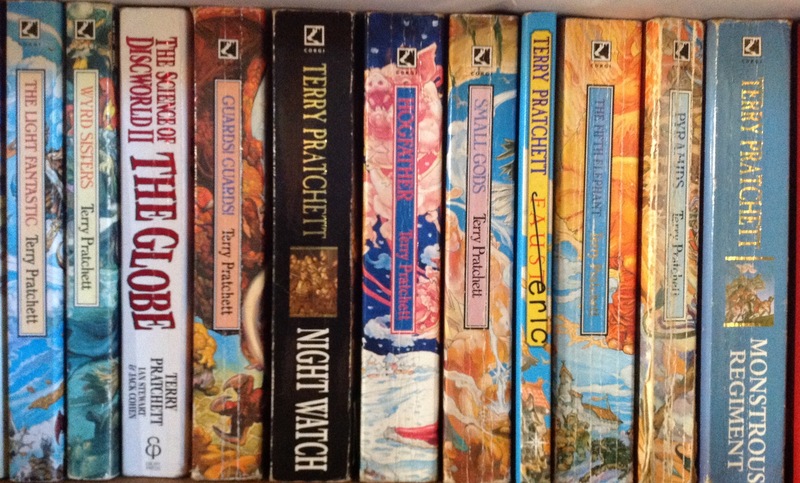 This entry was posted in Books and tagged Diskworld, fantasy, science fiction, Terry Pratchett. Bookmark the permalink.